We are a community choir — a group of adults who meet to sing and enjoy music together. We are a mixed group with a wide age range, and we welcome everyone. In particular, we are keen to recruit men, and younger singers, who are under-represented in the choir at present. Our belief is that everyone has a voice and can sing, so there are no auditions. People fit in where their voice feels most comfortable. Our repertoire includes songs from all over the world, particularly songs of celebration, peace and freedom. Most of our songs are three or four-part harmonies, rounds, or “call and response”. We are taught using natural voice methods and most songs are first taught aurally. We do provide copies of words and music, but you don’t have to be able to read music – many of our members don’t. We perform in public several times a year and all members are welcome to take part, although there is no pressure to do so. Most of us find performance exciting and enjoyable, but we understand that some will prefer just to come along to sing each week. 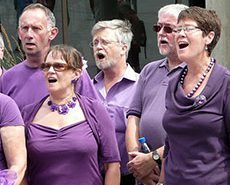 We are a community choir – a group of adults who meet to sing and enjoy music together.